Amy Gamble is a Mental Health Speaker, Coach & Advocate. Olympian and Bipolar survivor. Find out more about her and her cause and fight at amygamble.com. Amy Gamble is the Executive Director of NAMI Greater Wheeling. She’s been speaking for the past two years and has reached over 4000 people. From conferences to commencement speeches, Amy has given over 100 talks in two years. She’s well know for her inspiring and educational talks. Amy has a unique pathway to becoming a speaker. She has written a book entitled Bipolar Disorder, My Biggest Competitor: An Olympian’s Journey with Mental Illness . Some more information about her Olympic Career: She graduated from John Marshall High School in 1982) and is one of the Ohio Valley’s greatest female athletes of all time. Gamble excelled in three sports – basketball, track and women’s handball. She became Marshall County’s first Olympian when she competed with the U.S. Women’s Handball Team in the 1988 Games held in Seoul, Korea. Earlier, the U.S. Women were crowned as champions of the Pan American Games. Gamble was selected as the West Virginia Women’s Basketball Player of the Year in 1982 after leading John Marshall to the state Class AAA championship. She averaged 23 points and 18 rebounds on a 22-1 record team which avenged its only loss by defeating Elkins in the state finals. Captain of the All-State Team, Gamble was a two-time Class AAA first-team honoree. She was chosen All-OVAC and All-Valley three straight years. She was the first JMHS girls’ basketball performer to score more than 1,000 points and the initial Monarch athlete to have her jersey retired. She scored 1,498 career points. Gamble was ranked as the No. 4 girls’ basketballplayer in the country her senior season when was named to the Parade, Street & Smith and USA Today All-American teams. Recruited by Tennessee, she played as a backup on the 1983 Lady Vols’ squad that finished as the NCAA tournament runners-up, losing to the Cheryl Miller-led Southern Cal powerhouse. She left Tennessee at the end of that season and transferred to West Virginia University but played just one season before deciding to try team handball. After her appearance in the Olympics, Gamble returned to basketball and enrolled at the University of Arizona. Despite having just one season of eligibility remaining, Gamble was the team’s leading scorer and she earned Pacific-10 Conference player of the week laurels. Her high school track career was also brilliant, as Gamble set numerous invitational meet and OVAC records in the shot put and the discus. She established all-time OVAC standards in both events and was a West Virginia state champion in both events. She was a three-time All-Valley honoree. My biggest all-time accomplishment has been my personal recovery journey from bipolar disorder. Of course I’m not cured, but I am stable and have learned how to manage my condition. I say it’s my biggest accomplishment because it was more difficult than becoming an Olympic athlete, and that was a difficult challenge. But recovery took everything I had and then some. I’m proud of where I am today as a contributing and respected person in my community. 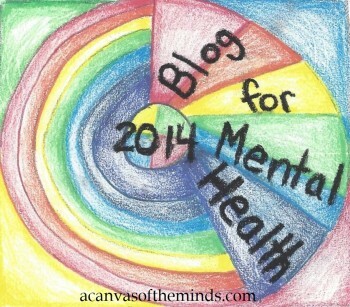 What are you most proud of in regards to your mental health advocacy work? I’ve had the unique opportunity to help a local NAMI affiliate (NAMI Greater Wheeling) grow. We have trained over 400 people in mental health first aid and were recently recognized nationally for our work. We have 7 support groups. And last November along with a community partnership with Youth Services System-produced a show called “This is My Brave.” The show gave 16 cast members the opportunity to share their stories of living with and overcoming mental illness. It was a tremendous event to shine light on these illnesses. So I’m really proud when other people want to get involved and help our efforts to implement stigma. Last week I had high school student who had read my book and performed a part of it for a speech competition. I was deeply humbled she would be inspired by my story of struggle and triumph. What are the biggest obstacles you’ve encountered dealing with bipolar disorder? Bipolar disorder can be such a debilitating illness. My entire life was essentially blown up once I became very ill. So, obstacle number one would have been learning how to manage bipolar disorder. Learning how the symptoms effect me and what my triggers are. It was hard to learn how to not blame myself for my illness, because there’s so much stigma that exists. Obstacle number two has been rebuilding my life. I lost my career of twenty years. I lost most of my friends. I’d been to the top of the world as an Olympian and then to the bottom when I was arrested during a psychotic episode. Overcoming all those things was very challenging, but I’m proud to say I did it. Do you think there will be a cure for bipolar disorder in your lifetime? I don’t know if there will be a cure, but I believe there will be more clear cut ways if diagnosing with the use of powerful MRIs. The way we diagnose is important to the credibility of professionals and will help eliminate stigma. I do believe one day genetic treatment will cure people with bipolar disorder. Are you married? Do you have any children/grandchildren/pets? I don’t have any children but I do have a dog and a cat who I love dearly. My dogs were always by my side whether I was manic or depressed and I write about them in my book. My family had also been the solid rock I can rely on for support. Why did you decide to write the book and how long did it take? I came to a point in my advocacy work and personal journey where I wanted to reach as many people as I could. I wanted people to know they are not alone. I knew having been an Olympic athlete and tremendously successful would shed light on the fact that bipolar disorder does not discriminate. And I also knew I have a powerful story of recovery, and my hope is the book will help one other person be inspired to recover. It took me about 1 1/2 years from start to finish including all the edits. I also had to take breaks because it was hard bringing up the difficult times. But in the end I can say it was incredibly empowering and really healing to write the book. This entry was posted in bipolar disorder, mental health advocates, mental health awareness, mental illness, Uncategorized and tagged amy gamble, bipolar disorder, interview with amy gamble, My Biggest Competitor: An Olympian's Journey with Mental Illness ., nami, olympian. Bookmark the permalink.